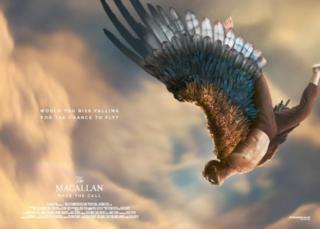 A whisky advert featuring a man leaping off a cliff has been banned for promoting "risky behaviour".The Macallan ad, which was broadcast on various platforms, showed the man falling towards the ground before sprouting wings and flying away.The Advertising Standards Authority (ASA) ruled that the advert was irresponsible.It said the opening scene could be seen as "reminiscent of the extreme sport of base jumping".The Macallan's owner Edrington had argued that its first global advertising campaign was a "fantastical story" which did not link alcohol with "bravery, daring or toughness". The regulator said it received six complaints after the advert was broadcast on TV, video on demand and Instagram in December.It noted that the opening scene in all versions of the ad featured a man running and jumping off a cliff. The ASA said: "We noted that at that point in the ads, there was no suggestion that the male character had any super-human attributes or powers, or that he was part of a mythical world".It also noted that the character was seen clenching his fists as he peered over the edge of the cliff, giving "the impression that he was nervous about jumping and was building up the courage to do so". The regulator continued: "In that context, we considered that the act of jumping off the cliff was very dangerous, potentially fatal, and consisted of extreme risk-taking behaviour. "That impression was compounded by the text 'Would you risk falling for the chance to flyThe ASA said that while it acknowledged that some elements of the ad were fantastical, it considered that its central message was "one of promoting risky or daring behaviour to reap possible rewards". It added: "Although the character was not seen consuming alcohol at any point, we considered the ads made a clear association between an alcoholic product and potentially very dangerous, daring behaviour and concluded that they were irresponsible." Reacting to the ruling, a spokesperson for The Macallan said the company had co-operated fully with the ASA in response to "a small number of complaints about our brand's global awareness campaign". He said: "In light of the ASA ruling, we have acted to address their concerns and removed the campaign film from relevant channels accessible by the UK audience. "As phase one of the campaign is now complete, we will take onboard the ruling as we plan for next phase of the campaign. "The overall theme of the global campaign is about bold decision-making and targeting a new generation of luxury consumers. "This will continue to be the focus of the global campaign, though we will of course take on board the ASA's comments in relation to the film elements in the UK market as we develop the campaign in the future."